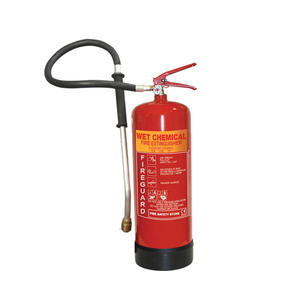 The extremely effective 3 Litre Wet Chemical Extinguisher (also known as the F Class) has been designed specifically for dealing with fires caused by high temperature (360°C+) cooking oils used in industrial catering kitchens and fast food outlets. Its capability to tackle such fires makes the wet chemical extinguisher the ONLY recommended extinguishers suitable for use on cooking oil fires. The 3 litre capacity makes it our medium sized extinguisher, perfect for kitchens in restaurants, chip shops and fast food outlets. Depending on size, it may also suit a school canteen. We only stock the finest products and this extinguisher has fire ratings, warranty, passed the 35kV Dielectric Test and is Approved to BS EN3.